WILLEMSTAD – Former Minister of Justice and former Member of Parliament for Pueblo Soberano (PS) Elmer Wilsoe remains a suspect in the murder case of PS leader Helmin Wiels. This was decided by the magistrate yesterday. 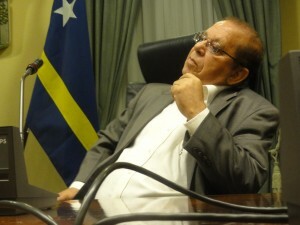 Wilsoe’s layer Bertie Braam had filed a second request to the court for his client to be removed as a suspect in the investigation named Maximus. A similar request was rejected 3.5 months ago. The ruling is another major disappointment for Wilsoe, who had hoped that with this request he can force the prosecution to terminate the investigation against him immediately. Wilsoe indicates that the investigation has been going on for years and since his first interrogation also took place more than 2.5 years. Wilsoe said that it is unfair that an institution such as the prosecution has so much power they can stretch an investigation for so long.